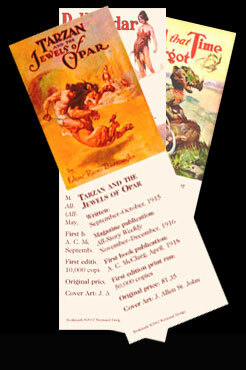 EACH RECOVERINGS DUST JACKET comes with a free, specially produced, bibliographic bookmark measuring 2.5" x 7.5" that lists the date when the story was written, the first magazine publication, the first edition publisher, the print run, the original price of the book and the cover illustrator. Each is printed on a heavy-weight matte stock and is as colorful as the jackets. Click the (Add to Cart) button and list the titles you want in the PayPal Instructions field. More bookmarks will be added as new jackets are completed.